Every room in every house is packed with electrical goods. We rely on them to know the time, for entertainment, to cook our food, for almost every function in life. But we also depend on them being safe – an electrical malfunction can cause a fire that can easily destroy a house and ruin lives. We assume the things we use, whether chargers for mobiles phones, kettles, toasters, and DVD players are safe. Most of us wouldn’t even know how to check. We leave them plugged in, the receptacles switched on and blithely trust that everything’s fine. But what if it isn’t? The electrical goods we buy in reputable shops all meet strong home safety standards for fire safety and carry a warranty. But what about those digital electrical goods you bought online? They might well be counterfeit, and they might well be hazardous, a severe danger to home safety. A bargain is always a good thing – or is it, really? You might think you’re getting a deal if you buy digital electrical goods, or electrical goods of any kind, on the cheap. But that knock-off from the market or an online auction site probably hasn’t been tested and might not have a kitemark (even if it does, can you be sure it’s real and not fake?). It probably won’t have a warranty worth the paper on which it’s written. Perhaps even more worrying is the fact that in the decade 1997-2007, authorities seized well over 10 million pieces of counterfeit electrical equipment. Not only did that include domestic electrical goods, but also the kind of gear builders and electricians would use, such as wiring accessories and switchgear. They might have been in convincing packaging, but the electrical goods had never been safety tested, meaning they represented a grave hazard not only to the people installing them, but also to users. For homeowners, things like extension cords and power strips, as well as batteries, have been found to be fakes – and again not tested, many of them coming out of China. There’s no absolute, guaranteed way to make sure you don’t end up with fake electrical goods. Scammers have been known to fake the kitemark, which is generally a guarantee of quality and safety. But, if you’re cautious about where you shop, only buying from established and trusted retailers, the chances of you being rooked and ending up with a fake are minimal. Yes, you might pay a little more, but in the long run it’s worth it for peace of mind. Not only do you have a warranty, but peace of mind regarding home safety and fire safety of your item. For contractors the problem can be a little trickier, although much the same applies. By purchasing items from well-established, reputable wholesalers who have good, secure supply chains, the chances of accidentally using counterfeit electrical goods are greatly lessened. 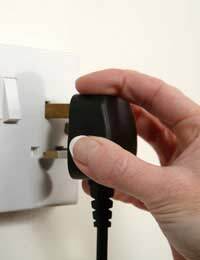 Since electrical goods are everywhere, caution is vital, for home safety, fire safety, for your own safety. When you buy from someone you don’t know and trust, you’re taking a risk – is it worthwhile?